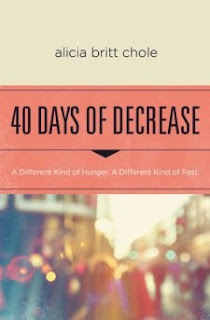 Alicia opens 40 Days Of Decrease with a Prologue entitled The Grand Reduction that is simply profound. She speaks of a Savior whose fast on earth began not in the Judean desert where he was tempted by Satan, but thirty years earlier when he came to earth and fasted omnipresence – angel worship – and the Voice that birthed planets. She reminds us that Jesus’ Grand Reduction began when He clothed Himself with flesh – accepted the disregard of man – and submitted to the silence of thirty hidden years. Alicia reminds us to fast increase, because decrease will purify our souls. A phenomenal book! In a world that touts never depriving ourselves of anything, the idea of fasting for spiritual reasons can seem out of place and extreme. Our decreasing that Christ might increase is a biblical principles. Lent: waiting, watching, wondering, making space inside to holding the hard things and the sacred sadness. And then, we awaken to Easter-day fullness, where death gives way to life everlasting and everything is rewritten in light of an empty tomb. What if Lent wasn't meant to be just a period of duty-bound deprivation? What if it could be a season of preparation, where a time of renunciation helps set our soul right and readies it for Resurrection fullness?